More than half of the copies in the Special Edition are already spoken for and there are healthy sales of copies of the main edition – this from our early mentions of the book as it was in progress through the press. Publicity, in the form of a pdf, is on its way to those for whom we have email addresses but to order you only need to contact us by phone or email to be sure of a copy. Do visit us at the Royal Academy if you would like to see a copy before ordering. Thomas Hardy’s wife Emma died in November 1912, in the attic room of their house where she had lived estranged from him. Their marriage had hardened into an empty shell and Hardy had long been in love with Florence Dugdale, whom he married the following year. However, on reading Emma’s secret memoirs detailing his cruelty and the breakdown of their marriage, Hardy was hit by an avalanche of grief. He returned to the north Cornish coast of their courtship and spent the rest of 1912 and 1913 producing his most lyrical and abiding collection of poetry. Mark Cazalet has created images to act as visual equivalents for the extraordinary insights Hardy found in the depths of his experience, rather than attempting his topography or historical period. He arranged the sequence to suggest his gradual reconciliation to guilt and grief, resolving into a dawning sense of acceptance. He was just completing the prints when Claire Tomalin’s recent book Thomas Hardy, The Time-Torn Man was published. 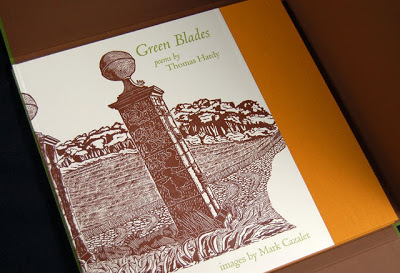 Green Blades – as we have titled this selection – reflects what Claire Tomalin calls the ‘rediscovery of repressed sorrow and forgotten love’. It was a long and painstaking task to cut wood and lino for the twenty-two large images and Mark was simultaneously working on huge murals, stained and engraved glass commissions and painting trips to Israel and Palestine for a magnificent series bringing stories from the Bible into the modern world. Each page opening involves text and image using three colours on characterful Italian white paper. The inks are specially mixed by Cranfield Colours from natural pigments. The binding has an image printed on the cover and then is surrounded by a cloth folding slipcase. 330 x 350mm. 48pp. Fabriano Tiziano paper. Centaur type. 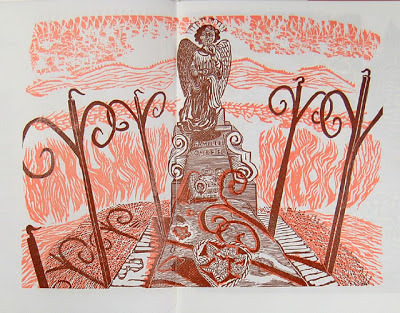 Each of the images is formed from one woodcut and one linocut and printed directly from the original blocks. Five colours are involved for which the inks were specially mixed by Cranfield Colours. 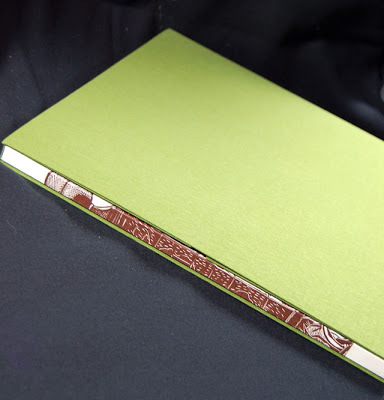 Case-bound with printed paper cover and cloth-covered slipcase by The Fine Book Bindery, Wellingborough.